Padded arm bands and steel hardware make these restraints comfortable and extremely tough. Easy release allows quick entry and exit from driver's compartment. Meets SFI-3.3 standards. 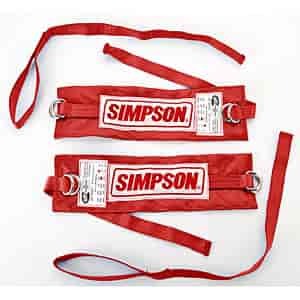 Individual strap restraints are used in most situations were rules require the use of arm restraints. Y-type arm restraints are usually required for confined space, open cockpit vehicles like Sprint, midgets, off-road, etc. Y-types have one strap that connects to the lap belt with easy release mechanism for quick and simple egress from driver compartment.